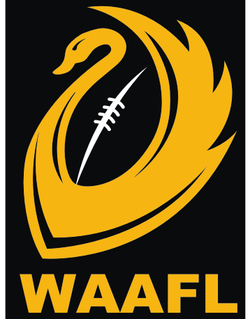 On Saturday 14 July the WAAFL is encouraging all players, officials and umpires to wear red arm bands to raise awareness of and remove racial vilification in football. The red arm band is used to symbolise Earth-Blood-Life; we come from different places, but we are all the same. Those wearing a red arm band will have committed to zero tolerance of vilification, abuse, and an understanding that we are alike. Red Arm Band Round also coincides with NAIDOC Week which celebrates the history, culture and achievements of Aboriginal and Torres Strait Islander people. 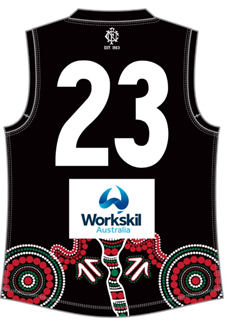 Some of our clubs have embraced Red Arm Band Round and NAIDOC week by wearing specially designed Guernsey’s. 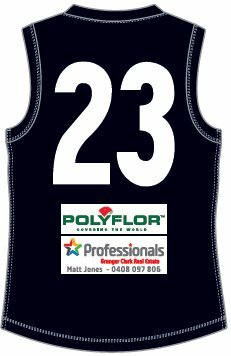 Ellenbrook wore the following Guernsey in their home game on the 7th July against Coolbinia. 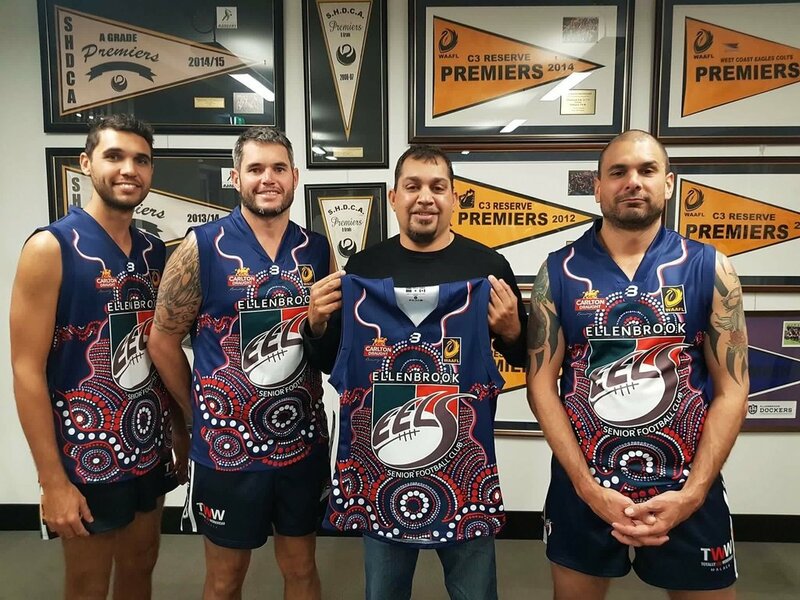 The club is celebrating their current and past indigenous players culture and heritage. The best Ellenbrook players were awarded the best on ground medallion named in honour of games record holder, inaugural player and Ellenbrook life member Robert Schnaars. 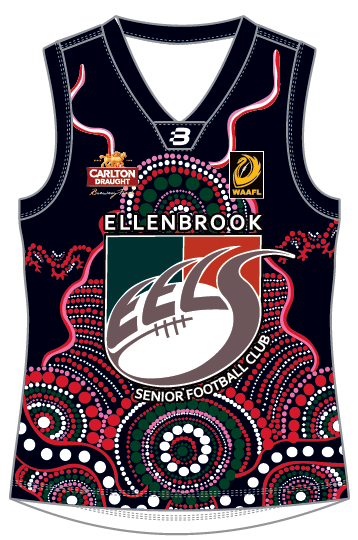 The jumper was designed by local artist Kevin Bynder with the artwork showing the old Ellenbrook before settlement. The area is called Whadjuk Gynning tribe which is part of the Mooro Yellowgonga territory. The circles are the old campfires which represents the familys of the tribe. The lines with the white dots represent the darling range which is believed to be the body of the waagyl (rainbow serpent) it is the boundary between the Balardong tribe and the Whadjuk tribe. At present Ellenbrook is surrounded by young families and lots of parks and is a very vibrant suburb, the circles also represent the families who have made Ellenbrook what it is today. The circles all lead back to the football club which means the club is being sponsored and supported by all the community. The spikey semi-circles up the top of the artwork represent the human footprints of those who founded the football club. On Saturday 7 July Gosnells wore an Indigenous inspired guernsey designed and painted by local artist Tamara Nicole Hayden to commence the celebration of NAIDOC Week. 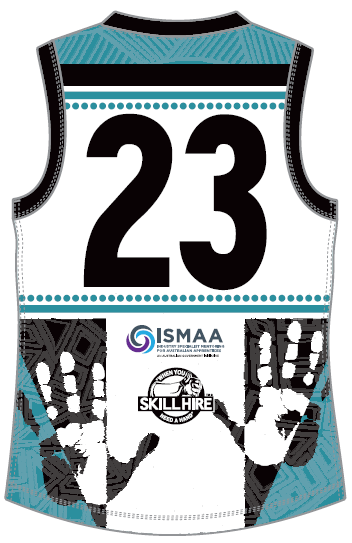 The jumper design not only represents the club and its Aboriginal players, but also the Gosnells area, people and landmarks. It recognises the contribution of Gosnells Aboriginal players past and present and our wider Aboriginal community. 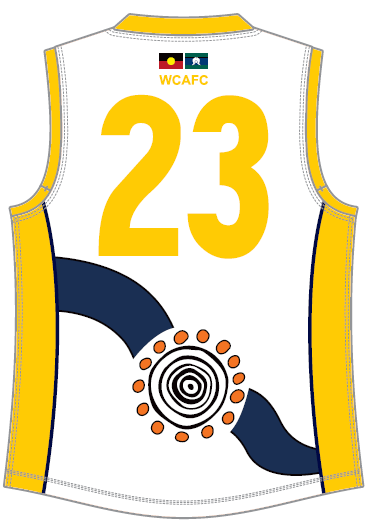 The Hawk, the club logo is centre of jumper. The two large meeting circles, one above and one below the Hawk represents the two locations the club has played at, as per the Centenary book From the Pub to the Paddock. The two smaller meeting circles represent the two junior clubs, Gosnells JFC and Huntingdale JFC, with the footprints symbolizing the juniors coming to the senior club. The U shapes around the meeting circles are people coming together, past present and future. The pattern on the bottom of the jumper symbolize the Djalgarra (Canning) and Southern River both which run through Gosnells. 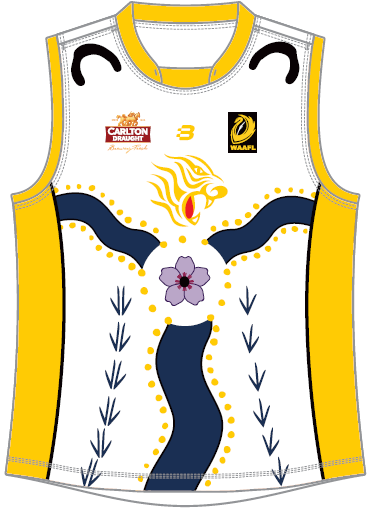 The pattern on the shoulder represent the surrounding Darling Ranges and the Sun. 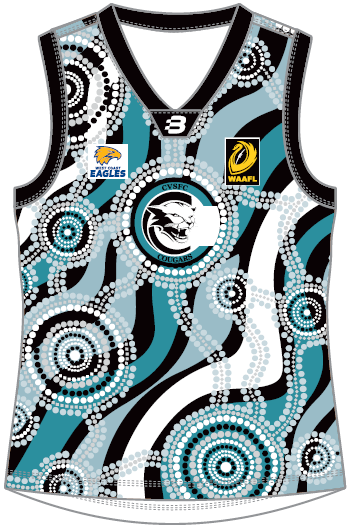 Nollamara will wear an Indigenous designed guernsey this Saturday 14 July across their women’s reserves and league side. 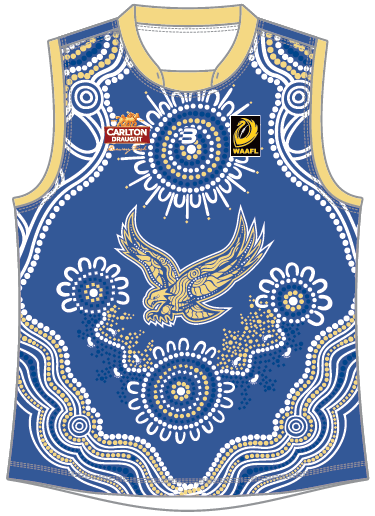 Designed by Kevin Bynder who is a current player for Nollamara, Kevin also designed this years West Coast Eagles and Port Adelaide AFL club’s Indigenous jumpers. The two circles on the bottom of the jumper represents the ethnicity and race of people in the Nollamara community. 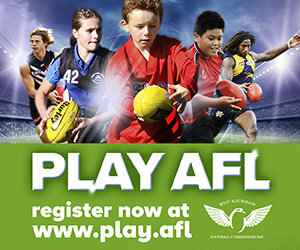 The circle on the left represents the Indigenous people of all areas who have played and are still playing for the club. The 2nd circle represents all those non-Indigenous people who come from all backgrounds to play for the football club. Together they come as one, surrounded by the Kangaroo tracks which is the nickname of the football club. The Kangaroo with its fast speed, amazing balance and high leaps is implemented by our footballers. The pathways then moves up into another meeting circle, this circle is represented by 5 semi-circles. These symbols are the 5 Nollamara football teams. The Central Cougars (jnrs), Nollamara women's team, Nollamara reserves, Nollamara league and Nollamara masters football team. They all have representatives who get together to discuss culture, diversity, football and the community. The clubs foundation is rich with talent and culture from both Indigenous and non-Indigenous, because this club has been and continues to be successful. 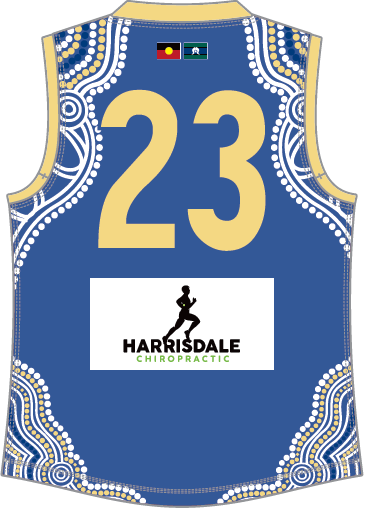 West Coast will be wearing these Indigenous guernsey's at their home match on Saturday 14 July. The two blue streams coming together to form one on the river represent the journey of The West Coast Tigers seeking to pay respect and to incorporate the proud Noongar culture at their club, West Coast Tigers to the left, Noongar community to the right. Very significant is the native hibiscus at the meeting point of the two streams as it is the flower that represents Sorry Day, and ongoing healing process of the Stolen Generation. The river, kangaroo tracks and emu tracks have been put in place where the three stripes normally reside. Kangaroo left, river middle, emu right. 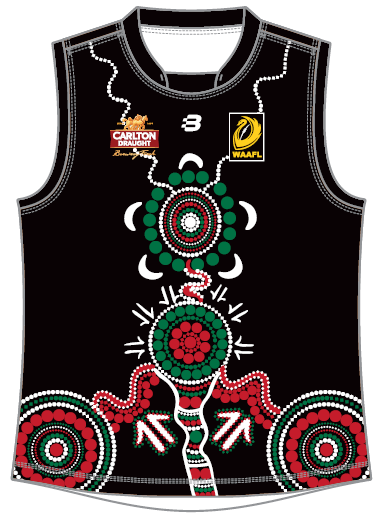 Furthermore, on the back of the guernsey the big circle in the centre represents the Noongar nation and the little dots around the big circle are the fourteen different clans within the Noongar nation in the colour of orange representing the fire. The two black lines on the shoulders are the symbol for person or people and represents indigenous and non-indigenous Australians. Finally, on the back of the jumper the river is always flowing as we travel on this challenging but beautiful journey together. Canning Vale Senior Football Club celebrated their indigenous round early on Saturday 16 June. The club wore one design for their senior’s sides and a different guernsey for their Colts side. Design “warrior” worn by the league and reserves sides was designed by Robin Keen. 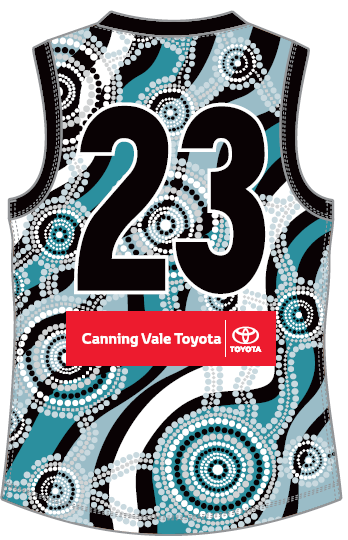 The jumper has one major element being the earth and rock which are the shape patterns imbedded into all the Turquoise and Black Patterns on the original jumper representing WA and its rough rocky terrain. Replacing the Black V on the front with a Boomerang shaped like a V. There are many types of Boomerangs however this shape is the only boomerang that comes back when you throw it. Used to hunt and initially being the first thrown to scare animals towards the thrower. This represents the team hunting together on game day with the players getting around each other. On the front there are two circle designs which represent meeting places. They are also surrounded by team members with rivers breaking off each meeting place. Alongside two rivers there are Kangaroo tracks walking alongside the river, representing Canning Vale before it was built up as land for housing. The two hand prints on the back represent the elders carrying and pushing us in the right direction whether this be in life or on the field. 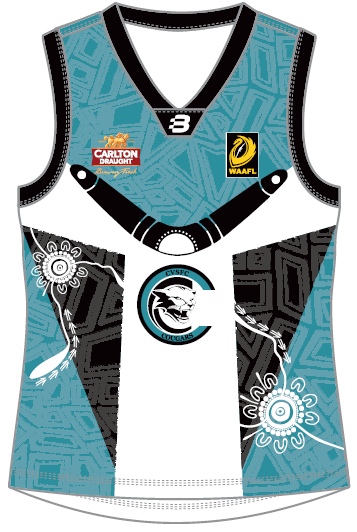 The colts Guernsey “ochre” was designed by didgeridoo dreaming. The circles represent the many tribes, their connections to each other and connection to the land. The design represents how at this football club we have people from all different places all come together and play football together.